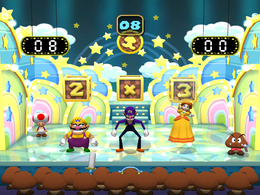 Mathletes is a 1-vs-3 minigame from Mario Party 5. Its name, "Mathletes", is a portmanteau of "math" and "athletes" used in real life to describe people who compete in mathematical competitions. Players must hit three Dice Blocks to create a math equation that consists of two numbers 1-6 and an operation symbol (+, -, or ×). The solo player hits all three blocks while each member of the team hits one. The solution to the equation is the number of coins the player or each member of the team will receive. However, if the player or team makes an equation that equals zero (e.g. 5 - 5), they simply receive no coins. The same result occurs with a negative number (e.g. 3 - 4). The largest number of coins one can receive from this minigame is 36 (6 × 6). Rules – "Form a mathematical equation by hitting three dice blocks. The equation sets the number of coins for each player (or team)." Advice – "The middle dice block sets the math sign and can alter the outcome drastically!" Itadaki! Koin Shō Receive the Coin Show! This page was last edited on February 3, 2019, at 20:07.